Learn more about the initiatives we take to care for our planet. At Spirit of the West Adventures, we understand that many of our guests come on our kayaking tours in Canada and around the world to participate in a style of trip that has minimal impacts on the environment. While we follow established minimum impact practices during our tours, our ideals don’t stop at the back door. We firmly believe that a business can operate successfully and still have a minimal or positive impact on the environment and community in which we all live. We aim to raise the bar in terms of environmental commitment and sustainability in the eco-tourism industry. We are not looking for a pat on the back for our efforts, but we hope to set new standards that encourage other tourism/business providers to also clean up their organizations and become co-leaders in sustainable and environmentally sound practices. Our practices are summarized below and feel free to contact us to discuss any specific questions you may have. 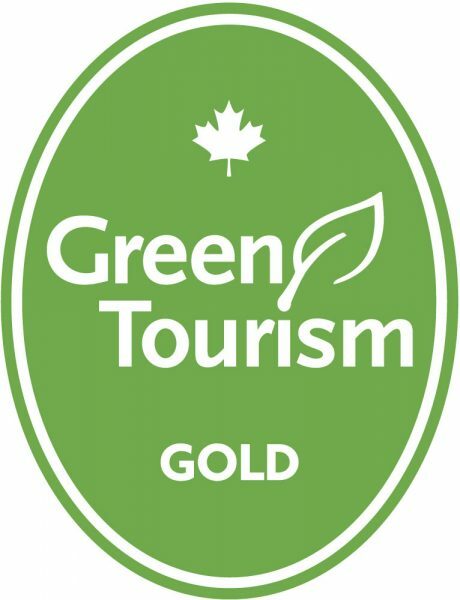 In 2015 we proudly received Gold Certification from Green Tourism Canada, the world’s largest and most credible sustainable tourism certification program. The exhaustive audit assessed all the policies and practices we have in place (and describe on this page) in order to determine our standing at their highest level. Green Tourism offers third-party verified assessments, advice and guidance to over 2,300 tourism businesses in Canada, the UK and Ireland. To learn more, visit www.greentourismcanada.ca. 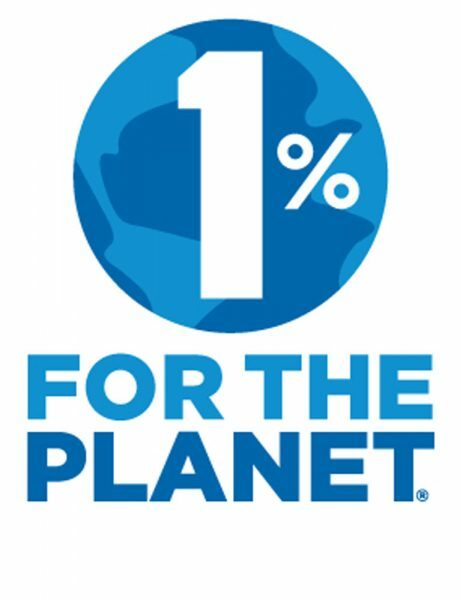 We also have been a proud member of 1% For The Planet since 2007. As part of our commitment to the environment, we donate 1% of our sales (not just profits) to organizations dedicated to protecting and preserving the environment. Over the years, we have donated over $67,000 with a record of $15,000 in 2018. In our actual operations in the field, we are committed to conducting ourselves in the most responsible manner possible – this goes above and beyond mere camping practices to include all of the elements below. While kayaking we practice minimum impact camping in order to preserve the nature of the coast. 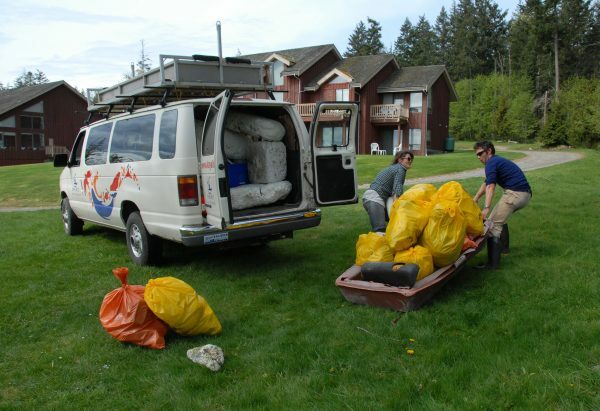 Human waste is dealt with in the most appropriate manner for the location we’re in, soap use in freshwater lakes and streams is not permitted, and at our campsites, we keep our ‘footprint’ as small as possible by keeping to established tent sites and trails. Our food is stored out of the reach of any curious animals so as to not alter their natural behavior. We respect the wildlife and believe in their right to exist without harassment, and while we treasure all sightings, we maintain a healthy distance. We also abide by all whale-watching guidelines and try not to ever disturb wildlife from their normal behavior. We are founding members of the North Island Marine Mammal Stewardship Association (NIMMSA) which was established to ensure best practices and responsible wildlife viewing standards for tourism operators. We have established with some and are working with others to establish protocol agreements with First Nations groups who consider the areas we travel in traditional territory. We hold all required permits and respect all the guidelines for operation set forth by Parks Canada, BC Parks, Crown Land and the Marine Protected Areas. We run our tours back-to-back, which allows us to never have an empty water taxi or van and minimizes our carbon footprint. We pick up our guests at their accommodation, carpooling to our various trip destinations. We use primarily Canadian-made and ethically sourced kayaking and camping gear. Every guest of Spirit of the West receives a re-usable mug to use while on trip, but to also encourage using a travel mug once back at home versus disposable cups when enjoying their daily coffee or tea. 100% recycled toilet paper (don’t worry it’s not recycled toilet paper, its toilet paper made from recycled paper, and other than saving many trees you won’t even know the difference from mainstream TP). We recycle or compost everything that we can. BC is lucky to have a great returnable drink container program in which we participate. Through our membership in 1% For The Planet, we donate to local non-profit environmental groups such as the Sierra Club of Quadra and the Quadra Island Salmon Enhancement Society. These organizations work tirelessly to promote a healthy environment and ecosystems in the Quadra Island area and beyond. Ethical and fresh coffee. We don’t think coffee can really get any better! We drink locally roasted (often roasted the day before the tour departs), fair-trade, organic, shade grown beans, produced by a woman’s co-operative. Our coffee comes from Aroma Specialty Coffee Roasters on Quadra Island. We grow what we can in our own gardens on Quadra Island, purchase from local organic farms for additional fruits and vegetables when in season and buy from our local grocery store for the rest. All salmon that we serve on our trips is locally caught wild pacific salmon. The delicious locally-baked breads we serve on trip are from Quadra’s own ‘Lovin’ Oven’ bakery or Steiner’s Bakery in Campbell River. We buy in bulk whenever we can. This helps us to minimize packaging waste. We compost all organic waste and use the soil for the Spirit of the West organic garden in which we grow some of the delicious foods we eat while on kayaking trips. We use only 100% recycled, unbleached paper for our printing needs, including our brochures (we don’t even use paper brochures anymore). We also ensure that we use both sides of the paper before recycling unneeded sheets. We have lots of natural lighting in our office space to lessen our dependency on artificial lighting. We ensure that we minimize power use by ensuring all of our computers and printers are turned off each evening and when not in use. We do not have air conditioning and instead choose to let the breeze in through our windows. OUR STAFF – The Ones that Make the Magic Happen! A positive, supportive and healthy work environment is key to a happy staff team – and happy guides make for fun trips! Here are some of the ways that try to make our company the sort of place that people want to be. We encourage healthy staff by choosing many organic foods for all of our trips. We provide returning staff health benefits & subsidies. Staff are able to choose how to spend this money to best aid in their overall health, e.g. massage therapy, naturalist visits, dentist appointments etc. We pay fair and competitive wages, which ensure a quality standard of living for our staff. Staff are encouraged to take home left-over unspoiled food from trips to ensure we minimize waste and to keep their living costs in check. We are providing more year-round employment for those who are interested through our international tours and office work. We encourage staff to ride their bikes or walk to work. We also provide our staff with safe bike storage and tools to maintain their bikes. Our strong focus on environmental education and personal development means we provide our staff with instruction from professional naturalists and historians, in order to learn about the areas in which we operate. We also offer grants to help offset the cost of continuing education courses and certification. We like to think of our organization as a community. We support each other and try to encourage independent thinking and freedom of choice/expression amongst our staff. Our staff work with us, not for us. Our base of operations is located on beautiful Quadra Island, BC. We are surrounded by a wonderful community that strives to work together to keep the island an incredible place to live. We operate our business from a small property in a quiet neighborhood on the island. We have made our property and home reflect our business practices and ethics. Trees on the property help to provide shade in the summer, a natural buffer to the road, and some even provide us with tasty fruits and treats. We collect rainwater for watering our garden and cleaning kayaks etc. The lawn is a collection of wild flowers and pre-existing grasses. We have a UV (non-chemical) water treatment system on our water to ensure clean and safe water for our guests and staff. The interior of the house is painted with low volatile organic compounds (VOC) paint which helps to keep the air we breathe clean. We use a front-loading washing machine for our laundry needs. This machine uses 13 gallons of water per load, versus a top-loading machine which uses apx. 45 gallons per load. Our machine also spins more water out of the clothes making the drying time shorter (we just use the outdoor clothesline and wind to dry our laundry anyway). We have a dual flush toilet. This toilet saves water by giving you the option of using a smaller 3.4 litre flush and a larger 6 litre flush. Older toilet models can use upwards of 15 litres of water per flush. We have a low-flow showerhead and aerators on all of our taps to minimize water usage. We get our firewood from locally managed, sustainable woodlots on Quadra Island. These are all little steps towards becoming a responsible member of the business community and community at large. This is an on-going process, which we hope is always improving and changing.